Back when I was a spotty teenager, Games Workshop was murmured with reverence in my, admittedly quite geeky, circle of friends. We used to spend many a night playing the various games that they produced, but our favourite by far was the board game of Space Hulk. The hulking Space Marines, Terminators in name and manner, versus the sneaky Genestealers was the basis for many a clash between me and my mates, fuelled only by the strongest coffee known to man. Now, Space Hulk has come to Xbox One in the shape of Space Hulk: Tactics, and I am almost besides myself with anticipation. Have Cyanide Studios done my memories proud, or was I destined to be disappointed? Come with me into the darkened corridors as I attempt to find out! First impressions of Tactics are good, with the scene set for an epic clash. A Forge World is directly in the path of a colossal Space Hulk that has appeared out of a warp gate, and the Blood Angel chapter of the Space Marines have been called to try and save the planet by destroying the enormous spaceship, which is really an accumulation of derelict spacecraft. They will have to board the Hulk, navigate its claustrophobic corridors and plant explosives at critical points to try and break things up. Given that the terminators stamp around in massive suits of Power Armour (think Brotherhood of Steel on steroids), you can quickly see that squeezing through narrow passages is not really what they were designed for. Just to add a little bit of spice to the missions, the wreck is also stuffed to the gills with Xenos, as the Genestealers are known. These four armed aliens are absolutely savage, and don’t take kindly to visitors, especially when they want to blow their house up. Armed with razor sharp claws, if a Genestealer manages to get within melee range with a terminator, it won’t end well for the man in the big tin can. Having chosen a side, either Marines or Genestealers, the missions can begin. There are campaign mode, skirmish or quick battle options, and also an online section where you can take on players from all over our globe. Add to this a mission editor tool, and the ability to upload your missions to the servers, and there’s certainly no shortage of things to do. Luckily, each mode plays in pretty much the same basic way, so the skills and tactics you pick up in the campaign will serve you well in the others. As you’d expect from a game with the word “Tactics” in the title, strategy plays a strong part, and some planning before the mission starts will certainly help. The Marines have a variety of units that can be unlocked as the game progresses, and the first step is to try and figure out what composition of squad will be effective. Heavy Weapons, Assault, Apothecarys and even Librarians can be selected, and the squad is led by a Sergeant, complete with an electrified sword. Again with the Genestealers, the types of units you can deploy change as they get further into their campaign, unlocking the likes of Broodlords for instance. 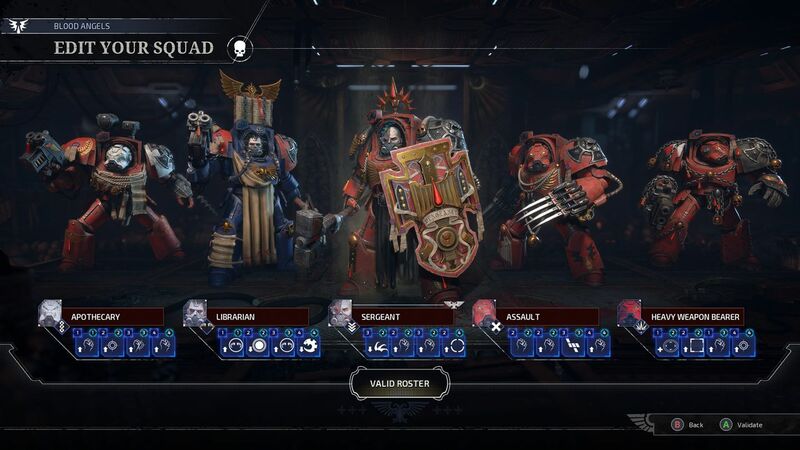 Each unit you have can also be upgraded, with weapon blueprints being unlocked for the marines, and the cards that can be played also enhanced. Upgrades rely on the resources that you collect as you explore the Hulk, with the map coming across as a series of nodes with encounters or surprises at every turn. The actual gameplay comes in two varieties. You can either see the game through the eyes of your active character, in a first person style, or have a 3D isometric view of the whole level. 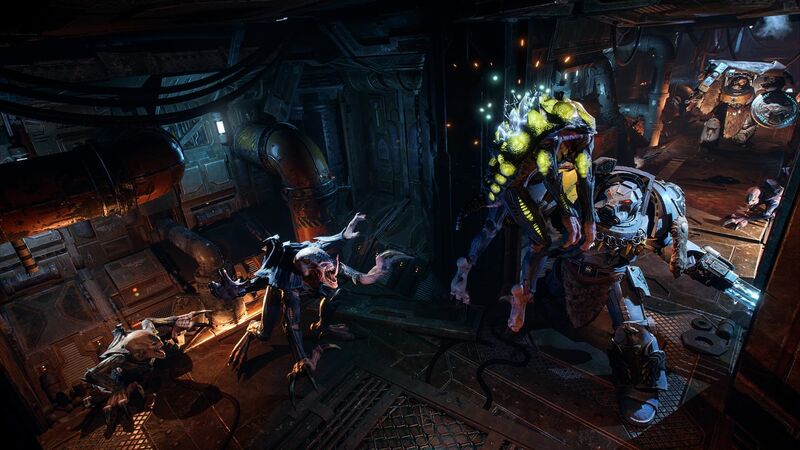 The first person view is very atmospheric, with Genestealers popping out of the dark corners right up in your face, and it certainly allows for more than its share of jump scares. But to me, this isn’t how the game should be played. See, to have the proper board game experience, the isometric view is the way to go, being able to see where the Xenos (or at least their motion blips) are and then being able to plan a desperate rearguard action. In play, the Hulk is divided up into a grid, and each character has a certain number of action points that they can spend; moving, interacting with items, or attacking. Marines get four points, and Genestealers get six. Marines, being in bulky armour, have to spend points to turn on the spot, whereas because the Genestealers are as nimble as a greased ferret, they can spin without a point penalty. Further to this, the former can attack from a distance with their Bolters, whereas Genestealers have only melee attacks, but because they are so fast they can close the distance very quickly. Attacking a Marine from the side or the rear is a good tactic, as they have no chance of counterattacking, and watching your character’s back has to become second nature. The Marines also have a handy tool – the Overwatch – which costs two points to activate but basically means that that if a Genestealer crosses your character’s vision they will be automatically fired on. This can counter the Genestealer threat almost entirely, as the AI Xenos seem to be be very risk averse, and the mere activation of Overwatch is enough to stop the Genestealers even popping their heads around the corner. There are a variety of different missions included, such as extracting an item, protecting an area for a set number of turns or even planting bombs in critical areas. Each mission has a primary and a secondary objective, differing again depending on the Marines and Genestealers side of the tale. So if the Marines need to protect an item, the Genestealers objective would be to destroy the item, or slaughter all the Marines, as an example. This can lead to some tense battles, as the Marines inch towards an objective and Genestealers mass around corners and behind doors ready to leap out in a wave of claws and teeth. As you may expect, learning the strengths and weaknesses of each unit is vital, and can be the difference between life and death. Luckily deaths aren’t permanent, and any casualties will be up and raring to go in the next mission. The Skirmish mode is pretty much the same as the campaign, but with time limits in place. If you complete a turn quickly, the next turn has more time available to you and so it’s worth acting as fast as you can. Sadly the Online side of things appears to have fallen foul of the Xenos threat, and after multiple attempts I’ve been unable to get into a ranked or casual match. 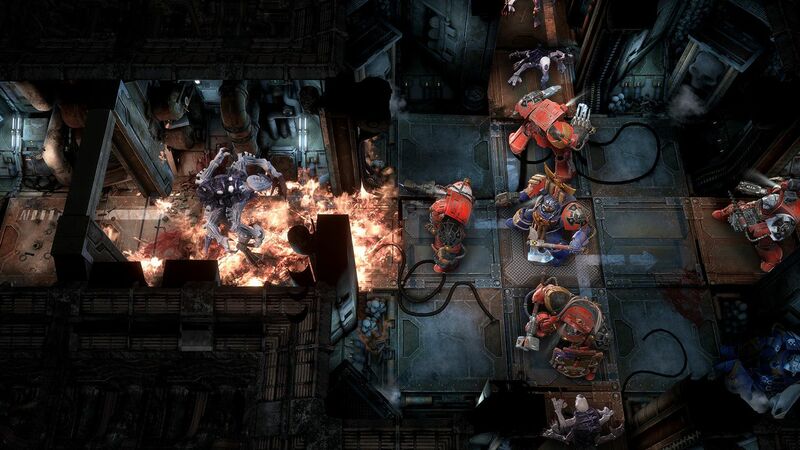 Graphically and Space Hulk: Tactics captures the feel of the Warhammer universe perfectly; the dilapidated surroundings of the Hulk, the massive armour and firepower of the Terminators and the sinister movements and animation of the Xenos. The first person mode shows these levels to greater detail, and having a Genestealer appear all up in your face can be worrying. Even still though, like mentioned, it’s not the way to play this game. The sound effects fit as well, with clanking footsteps and gunfire counterpointed by eerie hissing in the walls. The screams of a Genestealer as it claims a victim are chilling. Space Hulk: Tactics has taken me right back to my nerdy heyday. It plays just like I remember, and while I don’t have the luxuriant ponytail I had in those days, it made me feel young inside. A deep and involving combat system makes the game a delight to play, and the number of ways an objective can be achieved ensures that no two missions are ever alike. With the whole back story to be explored, the package on offer here makes me very happy indeed; it’s just a shame the online is pretty much dead. 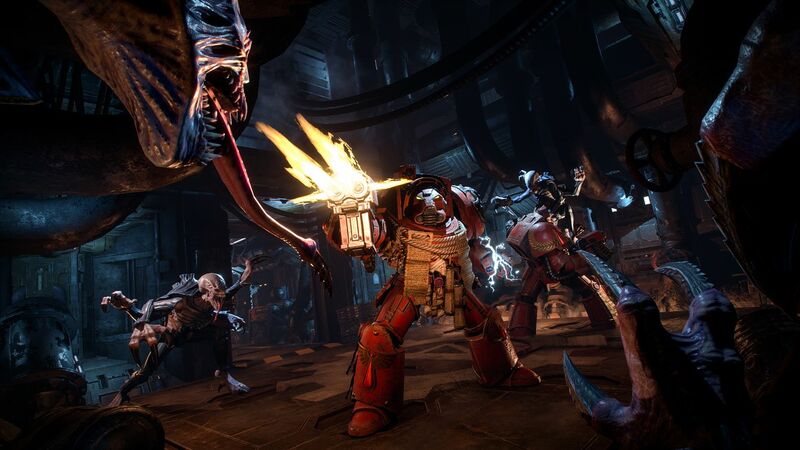 The best thing about Space Hulk though is found in the strategy and planning that you need, and as a result I have no hesitation in recommending this game to anyone who wants a game that can not just engage your brain, but also your trigger finger. Slightly nerdy... but hey we all play games, right?